Apple’s recent upgrade to Mac OS X El Capitan (from OS X Yosemite) represents a solid but by no means groundbreaking advance. The same can be said about the refreshed iMac computers that Apple unveiled Tuesday, which of course run the new Mac operating system software. That’s not a bad thing. iMacs were already the model for what an all-in-one desktop computer should be and they’ve only gotten better. Indeed, current iMac owners who are due for a replacement will surely give Apple’s latest all-in-ones the highest possible marks, especially those jazzed by the availability of a 4K Retina display on the smaller and more affordable of the iMacs. I expect new Mac buyers to be equally enthusiastic. As with their predecessors, the latest iMacs come in two basic sizes, 21.5-inches and 27-inches, and have the same knockout (if by now familiar) designs. There’s the protruding metal stand, and the slim and compact footprint with a back that bulges out ever so slightly, concealing all the innards of the computer. Those innards are more powerful now, with faster flash storage, more robust graphics, and the latest Intel processors: fifth-generation Core i5 or i7 chips on the smaller model, sixth generation “Skylake” chips on 27-inch models. On the rear bottom is the usual row of ports and connectors: two Thunderbolt 2 ports, four USB 3 ports, a memory card slot, headphone jack and gigabit Ethernet. Minor quibble: I wish the emerging USB-C connector was included. The headline though is the arrival of the seductive 4K Retina display (4096 by 2304 resolution) on the smaller iMac. The starting price for 4K Retina on this 21.5-inch model is $1,499, worth a splurge if you can afford it. Otherwise, you can spend as little as $1,099 for an iMac without Retina. Meantime, all the 27-inch iMacs in the lineup now get the 5K Retina (5120 by 2880) display that had been previously reserved for the highest end machines. 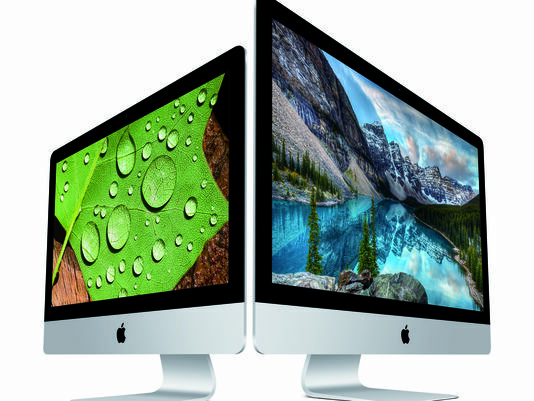 Starting price on these bigger iMacs: $1,799. On all the machines, Apple has a new Fusion Drive storage option that combines a 1TB hard drive with 24GB of faster flash. It’s a $100 extra I’d also recommend if it fits your budget. There are pricier storage upgrades too. Beyond 4K and 5K, Apple’s marketers go into painstaking detail promoting the wider color gamut available on the new computers. Side by side with an older iMac you can detect color differences: richer reds and greens in particular that are meant to show us on the big screen how such hues look in the real world. According to Apple, you couldn’t even see some of these colors on prior models. While the colors look beautiful on the new iMacs, the effects are likely too subtle to matter to anyone besides serious photography buffs and creative types. More evident are the changes to the accessories, specifically the wireless keyboard that Apple ships with the iMac, along with the wireless mouse and trackpad, the latter a $50 upgrade. It’s not that using the Magic Mouse 2, Magic Keyboard or Magic Trackpad 2 as Apple calls these, feel dramatically different, though the trackpad is wider and now adds Force Touch pressure feedback. It’s that Apple has eschewed the AA batteries required on the prior keyboard, mouse and trackpad and instead introduced versions with more environmentally friendly non-removable rechargeable batteries. You charge these Bluetooth accessories with the very Lightning connector used on iPhones and iPads. The accessories that ship with the computer are already pre-paired. If you add any of these separately (either to the iMac or other Macs), you can pair them just by plugging in the Lightning cable. Alas, sold separately, the new keyboard ($129), mouse ($79) and trackpad ($129) cost more than prior accessories. Absent the tube housing for AA batteries on the previous keyboard, the new model takes up about 13% less room on your desk despite having slightly larger keys. Despite that, I got used to typing on it pretty quickly. We are in a computing age where desktop machines mostly play second fiddle compared to laptops and notebooks. But if the need for mobility isn’t a major sticking point, you still get more bang for the buck with a desktop, even on a pricey iMac. And if you’ve been patiently waiting for 4K on the 21.5-inch iMac, you’ll appreciate that bang even more.